Thanks to the "Digimon Adventure tri." Series "CSA Digi Vice Tri. Memorial" appeared! As a memorial to "The Digimon Adventure tri. Chapter 6 Our Future" will be screened on May 5, 2018, the item "Digivice" that appeared in the theater will be shown as " Complete Selection Animation "series. 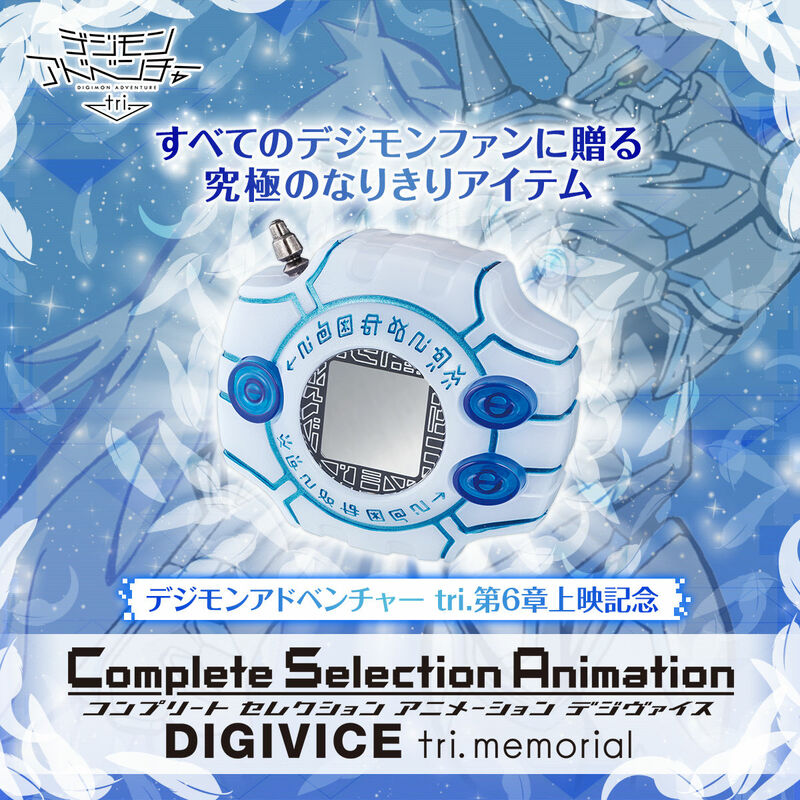 From the "CSA Digivice" launched in 2015, we redesigned the color, the body of opalescent and the new form of the ultimate body Digimon "Omegamon" appearing in the play with blue line painting that represents tears "Masters Full Mode" image. The die-cast antenna and Sumi put Digi characters are also alive. By pressing three buttons equipped on the body, you can record impressive speech sounds (about 100 types) and representative songs from "Digimon Adventure trio" chapter 1 to chapter 6. Moreover, it can enjoy the light according to the serif and BGM, and it changes to orange when it is serif of Tao Agumon, blue when it is serif of Gabumon · Yamato, red when it is serif of budding heart. You can enjoy the bilingual dialogue between three "Chosen Children" such as Taichi, Yamato, Buddha and three partner Digimon. Agumon: My hungry has decreased ~~~~ !!! Taichi: Are you going to stay wherever you are! Gabumon: There is only Yamato possible to replace Taichi. "Butter-Fly ~ tri.Version", "brave heart ~ tri.Version"
By pressing the dialogue play button during BGM playback, you can enjoy two patterns of "Digimon's evolution dialogue" and "Partner and Digimon's battle serif". Agumon: "Agumon evolution! Graymon! ", "Greymon Super Evolution! Metal Greymon!" Taichi: War Greymon! I will decide here! Yamato: There it is! Garurumon! In addition, memorial visual seat is included as a purchase award. It is a special seat which can be obtained only by designing 9 children to be newly drawn and selected.